Cal here to pick up on the tumblers and pitchers discussion. 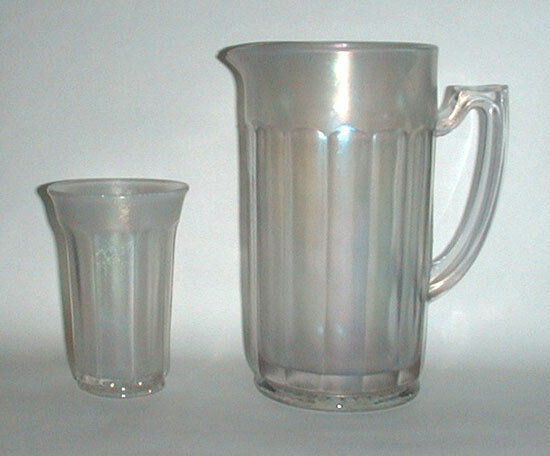 Tonight we will take a look at the stretch glass pitchers and tumblers from Imperial. These need little introduction to the readers of this mailing list. Undoubtedly many of you have these, or at least some of these, in your collections. They are “Chesterfield” and I find them to be very much in demand. 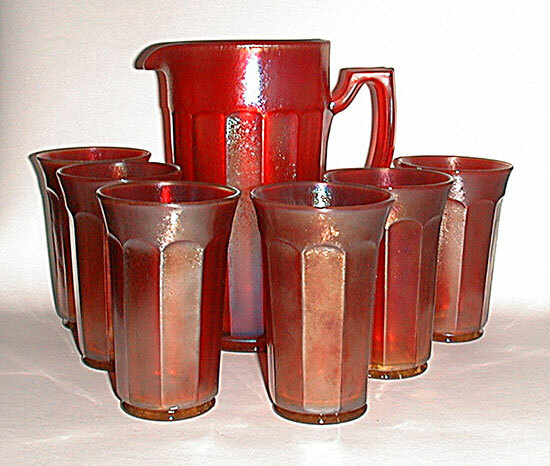 The pitchers are scarce or rare; the tumblers are hard to find and when I do find them they are expensive. 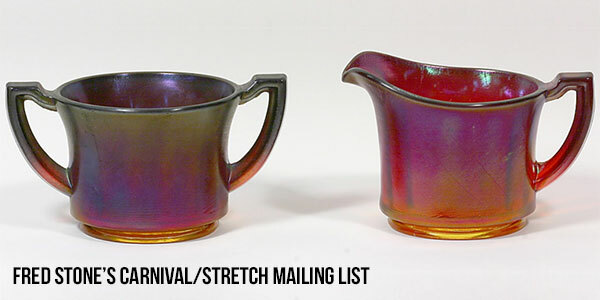 I’m not aware of very many full sets – pitcher, cover & 6 tumblers – in any of the stretch colors. While covers for the pitchers do exist (at least in some colors), they are so rare that most of us are not concerned with a pitcher having a cover. If we find a cover with a pitcher or find one later, that is just a bonus. 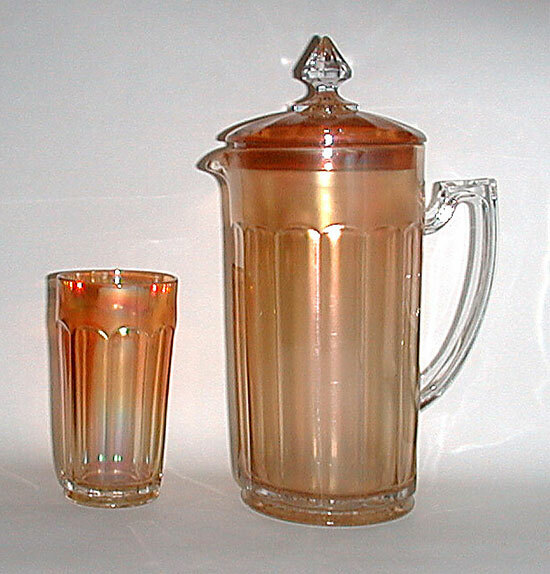 That being said, the cover for the pitcher which is in color a light pinkish marigold and typically more shiny than stretchy seems to show up more often. I’m fortunate to have 2 pitchers and both have covers. 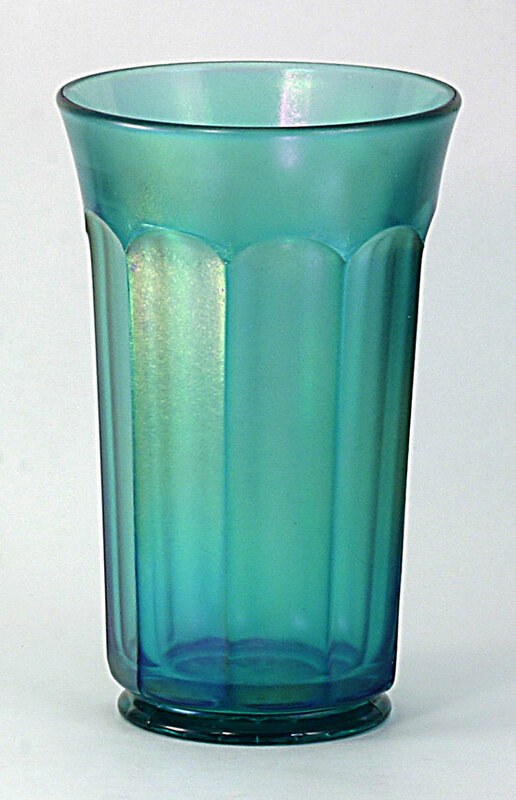 I have tumblers as well in this color. 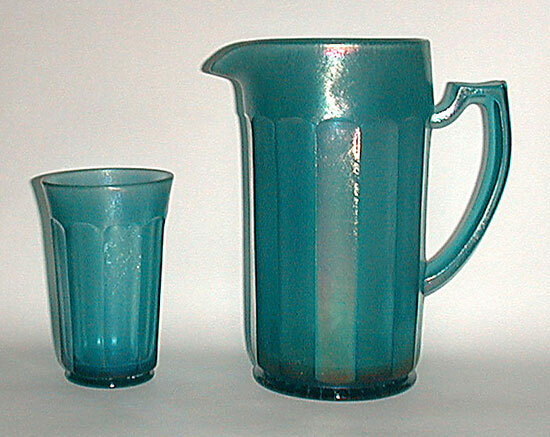 In addition to the pinkish marigold color, the pitcher and tumblers are known in Iris Ice, Green Ice, Ruby Ice and Blue Ice. 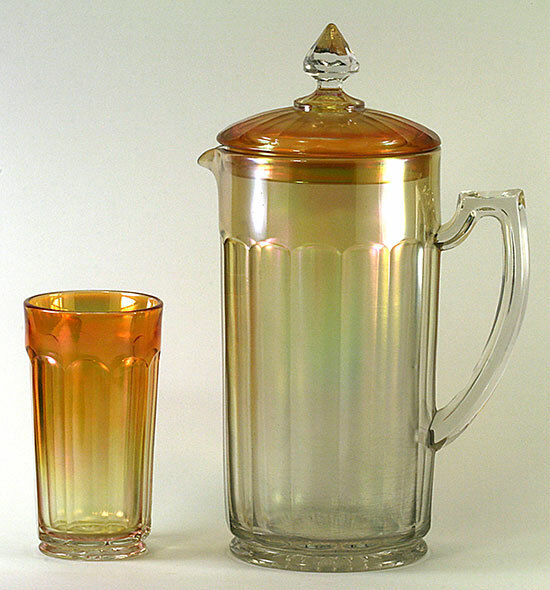 Six tumblers and a pitcher make a beautiful water set and are quite pricey to assemble. I will surely never use the pieces I have on a table to serve iced tea or lemonade or any other beverage. They are safely on display in my cabinets and that is where they are going to stay! There are some differences in the tumblers. Some are flared a bit at the top and others are not flared at all. 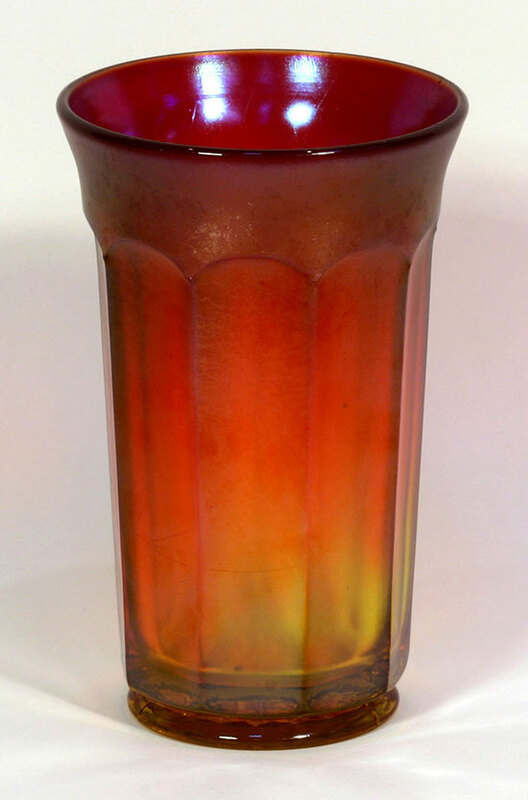 My experience says that the tumblers with the more straight top are usually marigold while the other colored tumblers seem to have the flared top. Some believe this to be a significant difference, making those tumblers of which there are fewer more rare and valuable. I’ll defer to the Imperial experts on this. I’m just happy to have tumblers. Here are some photos from Dave’s library. I think we would all get quite excited if we saw a selection of these offered in an auction; it is more likely that we might have an opportunity to purchase them from someone else in a private sale. While I am not able to include a photo of a complete set in Iris Ice, I do know of at least one complete set and there may be others. I’ll try to get a photo and post it at a later time. 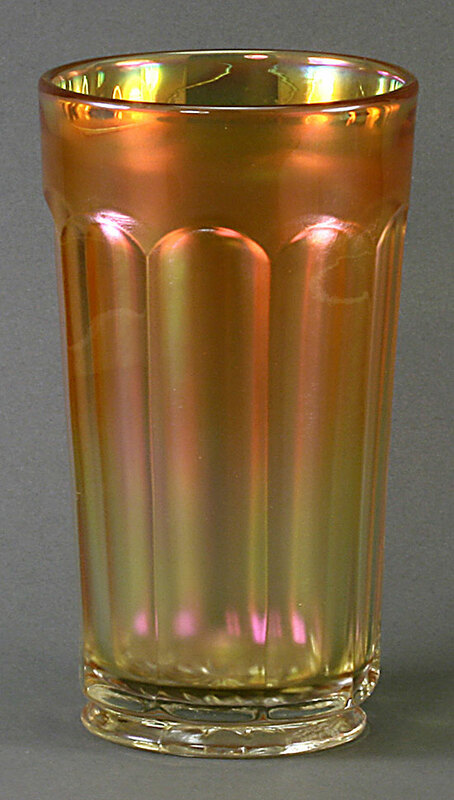 Ok, enjoy the photos and next time I am up we will look at another company’s pitchers and tumblers.